SPOKANE, Wash. -- Conservationists and others have renewed a push to remove four giant dams from the Snake River to save wild salmon runs, after a federal judge criticized the government for failing to consider whether breaching the dams would save the fish. The judge earlier this year rejected the government's fifth and latest plan for protecting threatened and endangered salmon in the Columbia River system. Agencies must take a new look at all approaches to managing the southeast Washington dams, including breaching, said U.S. District Court Judge Michael Simon in Portland, Oregon. Wheat from as far as North Dakota is shipped downriver by barge for export to Asia. The Snake River also is used to transport about 60 percent of Washington's wheat and barley crop to Portland. (see bluefish correction below) A tug pushing a barge can haul a ton of wheat 576 miles on a single gallon of fuel. 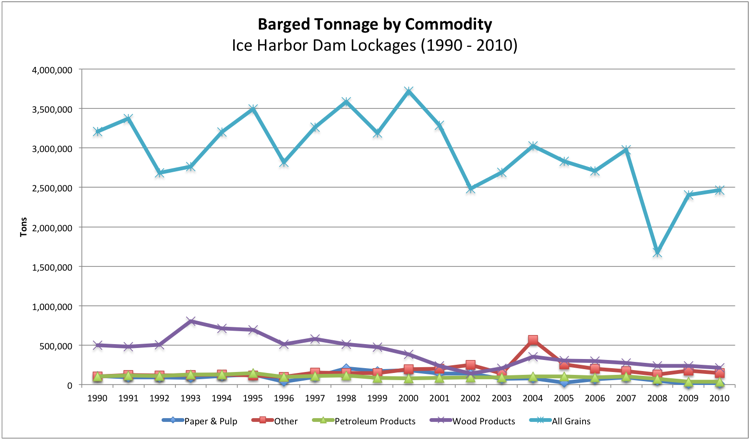 The Columbia River System Operations (CRSO) describes shipping on the Columbia River, shipping which would continue to occur even without dams on the Lower Snake River in place. Greater than half of the commercial navigation on the Columbia–Snake River System is exports. However, it is also an important transportation route for goods moving to the interior, such as fuel to the Tri-Cities area and up to Lewiston, ID. Some of the top exports are wheat, oilseeds (soybean, flaxseed and others), lumber, and corn. The top imports include iron and steel products, manufactured equipment, and building material like sand, gravel, stone, building cement and concrete. An average of 57 million tons of commodities were transported in 2010–2014, which would have required transport by over 2 million semi-trucks. Of that, approximately 36.6 million tons were exported to foreign destinations (64%). Washington is the fourth largest wheat producing state in the nation with more than 2.2 million acres in production.What sets Washington farmers apart is their ability to raise, or yield, more wheat on those acres than others. On average, dryland, or non-irrigated, farmers can raise about 65 bushels per acre. In fact, Whitman County produces more wheat than any other county in the U.S. Also, Washington wheat is some of the highest in quality throughout the nation.